Originally published in The American Prospect on June 10th, 2015. Technology in the service of democracy—“civic tech”—has become the cause of a growing number of coders, hackers, political strategists, non-profit executives, activists and others who come together at an annual conference called the Personal Democracy Forum (PDF). The most recent meeting in New York City on June 4 and 5 attracted about 850 participants. But as that meeting showed, the civic-tech world is divided on a fundamental question. Some strive to avoid anything that could appear partisan or ideological, while others believe that civic tech’s shared vision cannot come to fruition without challenging power. PDF’s co-founders, Micah Sifry and Andrew Rasiej took a clear position: “Civic tech cannot be neutral,” they said. “When a few have more than ever before, and many are asking for equal rights and dignity, civic tech cannot be simply about improving basic government services, like making it easier to know when the next bus is coming or helping you file your benefits more quickly,” Sifry and Rasiej wrote in a packet given to each conference attendee. While these innovations are helpful and represent the present focus of civic tech, PDF’s co-founders insist that those innocuous steps cannot define its future—not when the barriers to political participation are so divided by class, race, and geography. Other speakers offered a vision of social change through collaboration. “Imagine how we can reshape the future of work together in humane and kind ways,” said Palak Shah, the Social Innovations Director of the National Domestic Workers Alliance (NDWA), who aims to improve labor conditions through market-based solutions. Shah tries to bring about “creative collisions” between “nannies and coders, activists and hackers” to build a mutually beneficial future for businesses and social movements. 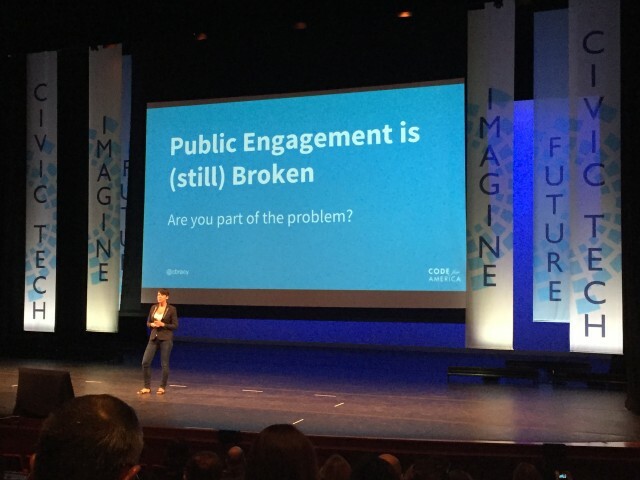 One afternoon I attended a PDF breakout session called “Understanding and Overcoming Barriers to Participation”—a panel of researchers and experts exploring how to engage more people in civic life. Jon Sotsky, the director of strategy and assessment at the Knight Foundation, discussed some of his organization’s new research findings on millennials and voting. According to this research, while young people overwhelmingly believe they can have a greater impact locally, they are far more likely to vote in national elections. Sotsky attributed the lower rate of voting to a lack of good voting information at the local level—a problem, he said, the Knight Foundation will be addressing through new projects aimed at creating more comprehensive repositories of civic information. No doubt we should conduct more research and improve local civic information. Whether that will actually make a difference in voter turnout is another matter. “Technology cannot solve the big stuff, even if sometimes we’d like to believe it can,” Sotsky said, in one of the conference’s more humble moments. Technology’s role in these situations, he suggested, could be to help foster attachment between residents and communities, deepen social networks, and support the value of voting. But we’ve already seen what can happen when the tech world turns to politics, as it did in the conflicts over SOPA, PIPA, and net neutrality. What if the same energy was directed towards removing voting restrictions? There’s a lot about civic inequality that we already know. Some barriers to participation may be reduced through better-targeted education programs and redesigned civic forums. But political inequality is not something that will be solved by an app. There’s no Uber for voting. For the marginalized to have more power, others will have to relinquish some control, and we can’t escape or obfuscate that discussion.